This wonderful postcard sent to a child, shows three children fervently guarding their bunny from enemy attack! 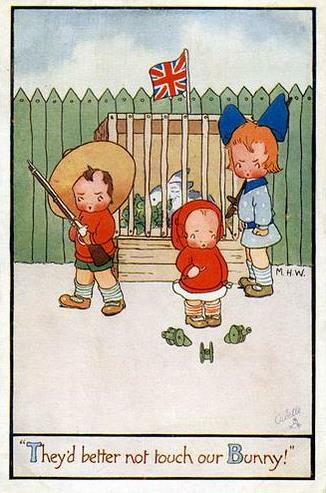 “They’d better not touch our Bunny!” is the caption accompanying this illustration by ‘M.H.W.’, as is written beneath the fence on the right; ‘Oilette’ can be seen in the bottom-right-hand corner. ‘TEACHING THE YOUNG IDEA HOW TO SHOOT.